SIRTE - The fate of this city, ousted Libyan leader Muammar Gaddafi's hometown, symbolises what may await supporters of dictatorial leaders across the Middle East. From the grizzly end meted out to Gaddafi himself, to the suffering of those who once supported him, it serves as a reminder of the dire price of failure, as well as the human consequences of revolution. 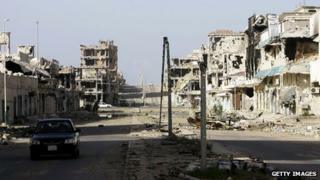 For several weeks during September and October last year, fighting raged in Sirte. It and the rampaging of revolutionary militias that followed in its wake turned it into the most destroyed city in Libya. Area Two, the neighbourhood where Gaddafi fighters fought until the end is the most destroyed, with hundreds of shattered homes, but across the city the destruction was widespread, claiming hundreds of lives, turning tens of thousands into refugees. Now its citizens allege they are the victims of arbitrary arrest, torture, and theft. The culture of revenge is strong here, and many Sirtis argue that militias from places like Misrata and Derna came seeking payback for the crimes of the Gaddafi years. The details of what we found will be the subject of a forthcoming Newsnight report, but there are some things that the camera misses or people who talk to you but refuse to be recorded, even anonymously. So here, I will stick to those more fleeting impressions. Support for Gaddafi is still rife in Sirte although nobody apparently wants to say it on camera. Instead groups of boys clustered around us, briefly chanting some pro-Gaddafi slogans before disappearing into alleyways or their homes. Blaming Nato for their current misery, some threw stones at us. Everywhere you go, as a foreign media team, you feel you are being watched. Filming on the outskirts of Area Two, a car with a couple of men of military age appeared, then another, followed by more on foot. Soon there were a dozen or so of these men, surrounding us, all wanting to find out what we were doing. Our explanation seemed to satisfy them, and they dispersed. At other times though we were being watched from a car that had been daubed with paint, rudimentary camouflage, like many vehicles going to the front lines were during the recent fighting. Were they former Gaddafi fighters? Like those who surrounded us in Area Two, it was clear which side they were on. As for the new revolutionary authorities, they were keeping an eye on us too. A Sirte Military Council has been established of people loyal to the new government. Not everyone in Sirte supported the old order, so some of these people have combined with fighters from elsewhere to police the town. Three times we saw vehicles with markings from the new security force stop, as its occupants asked people what we were up to. The men in the cars had the big beards that many locals claim mark them out as Islamist militias from Derna or elsewhere. Like so many claims in Sirte, this was hard to verify with certainty, but it seemed to add up. In one house we met some men who told us of their suffering since the Sirte had fallen to revolutionary forces. One alleged that he had been detained by the Sirte Military Council and tortured, producing medical evidence of his ill-treatment. Neither he nor his friends would be recorded, even anonymously, one telling us, "we are so afraid to speak to you". It is clear enough though that hundreds of men, it may even exceed 1,000, from Sirte have been detained by the new authorities since Gaddafi's demise on 20 October 2011. Some were fighters, others apparently had no connection with the old government. We spoke to two who had been incarcerated by the Misrata militia in their home city, around 250km (155 miles) from Sirte, but subsequently released. Both maintained they had been well treated, but refused to say this or anything else on camera. However, a relative of one claimed that he had been tortured. Whatever the truth in these two cases, it is evident that there has been abuse of detainees in Misrata, the French organisation Medecins Sans Frontiers withdrew its staff from the city's jails last month, saying they had treated more than 100 torture victims, and could not carry on with the business of patching people up so their interrogations might continue. Human rights groups estimate there are nearly 3,000 people being held by the authorities in Misrata. Talking to Ramadan Zarmouh, the commander of the Misrata militia brigades, he denies the charge of abuse entirely, saying there has been no mistreatment. In Sirte itself the complaints are rife as its people try to get back to normal - from a lack of electricity and clean water, to a critical shortage of bank notes. Some of these gripes are shared by people in other Libyan cities, but the sense that they are being discriminated against adds edge to them here. As we left, we saw long queues at petrol stations, something we had not seen elsewhere. The widespread fear in this community is that they will be discriminated against with new development or reconstruction projects. Some Libyans elsewhere do not deny it, arguing that Sirte got more than its fair share of the investment in Gaddafi's time, so now it can go to the back of the queue. Will the town and its tribes such as Gaddafi's own now form an underclass in Libya? There are two narratives: the first that, Inshallah, the wounds will heal slowly but surely with Sirte taking its place alongside other communities; the second is that the seeds of a new insurgency are been sown here. If the new government wishes to avoid the latter, it would be well advised to curb some of the arbitrary detention and misbehaviour of militias, which people in Sirte have told us seem like revenge pure and simple. Post scriptum: Just after we left the city, the Sirte Military Council said it had arrested a 12-member armed gang, accusing its members of murder. Is this a pro-Gaddafi insurgent group? It is possible, but equally so that the arrests represent an attempt by the revolutionary militias to justify their continued crackdown on people who they consider loyal to the old regime.